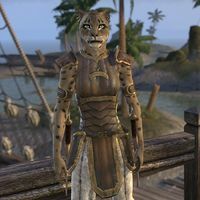 Captain Jimila is the Khajiit captain of the Prowler, a ship initially found wrecked on the west side of Khenarthi's Roost, in the Shattered Shoals. Two of her crew are missing, and you are tasked with saving them from a Maormer ritual. 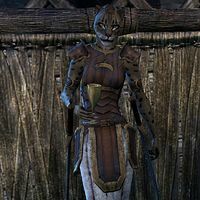 Later, the repaired Prowler will take you to Auridon after you have saved Khenarthi's Roost from another Maormer plot. If you meet her in Vulkhel Guard while The Interim Suitor is docking in the harbor instead of the Prowler, she'll only ask, "What can I do for you?" If she is spoken with before starting Cast Adrift, she will refer you to her quartermaster. "I don't have time for you right now. The Prowler's damaged and unless we get some help, she'll founder at high tide. You want to help? Talk to Quartermaster Oblan." Once you have been directed to the Prowler she will not be friendly to you before you help get her ship seaworthy again. "If you're not here to help, get off my ship." Afterwards helping with the repair efforts, Oblan will direct you to her for her final word on reinforcements. She instead has important information. Once you have spoken with Mastengwe, you can return to Jimila and ask her some questions about herself and the Prowler. "You heard Mastengwe's story. If the Sea Vipers call up another hurricane before the tide rises, the Prowler will be smashed to pieces." "Of course. What do you need?" "I spent much of my youth in the Summerset Isles, amongst the Altmer. My parents were travelers who always had an ear to the ground. If you understand my meaning. After they died, I went to sea. It's how I ended up on the Prowler." Is the Prowler a Dominion ship? "No, but she serves the Dominion. Queen Ayrenn gave me our letter of marque herself. We were asked to scout for the fleet. The only thing we spotted was a hurricane." After saving her crew members and stopping the ritual, you can can return to Jimila. Afterwards, you can ask her about Mistral and the Maormer. "We'll take the marines with us when we sail to Mistral. I hope to see you there." What can you tell me about Mistral? "Small port, serves as a trading hub for the moon-sugar plantations on Khenarthi's Roost. Home to the tastiest double rum in the southern seas. Lots of Maormer there. They even have an embassy. That means problems for the Dominion." Why are Maormer a problem for the Dominion? "Maormer are Sea Elves. The High Elves kicked them off their island, so they found a new island. But for some reason, even though nobody's around to remember any of this, they want the first island back. Elven feuds. You know how it goes." After preventing the Maormer ritual, you find her at Cat's Eye Quay. She is willing to take you with her when the Prowler sets sail for Vulkhel Guard. "The Prowler is headed to Auridon, and we're happy to ferry you there. When you're ready, hop in the launch. We'll set you up with your own bunk." Why are you heading to Auridon? "Chests full of gold. Owning a sound ship after a hurricane can be quite lucrative, even when the only cargo is Dominion luminaries seeking passage. Don't worry, I won't charge you. Without your help, the Prowler would be a mass of broken timber." Is your ship ready to sail? "Aye, the Prowler is fully restored and ready for heavy seas. Quartermaster Oblan even managed a few improvements using some Maormer … donations. Have no fear, she'll get you safely to Auridon." 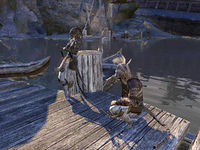 Once you arrive in port of Auridon, she can be found on the deck of the ship. "It's good to see you, friend. You will always have a place aboard the Prowler." Queen Ayrenn directs you to her for passage to Elden Root. She is found in Skywatch, apparently because of the festivities, while her ship is safely leftin Vulkhel Guard. Queen Ayrenn said you could take me to the port of Haven. "The queen? Of course we can do this! We shall set out for Haven at once, if you are ready." "Where we left it, I'd hope. But come, join me for a drink! It's good luck to share a glass before a long voyage. Unless you can't handle the stuff. Then you can meet us in Vulkhel Guard." You can choose to have a drink with her, or meet her later in Vulkhel Guard. No thanks. I'll meet you in Vulkhel Guard. "Suit yourself. The Prowler will be ready to sail when you arrive." All right. I have time for a drink. "How about a friendly wager? We match each other, glass for glass. Win, and you travel to Haven in the privacy of your own cabin. But if I win, you launder our clothes for the entire voyage. Deal?" On second thought, I don't have time for a drink. I'll meet you in Vulkhel Guard. If you buy the drinks, we have a deal. And speaking of bottoms, my quartermaster prefers a crisp fold in his breeches." If you decided not to drink with her, she'll say if you talk to her again, "Meet us in Vulkhel Guard. We'll head there right away. As soon as we finish our drinks." "My head feels like a thunderbug crawled inside it. But I did win our contest. Oblan will bring the laundry for you. Every morning." [Intimidate] That's not true! I won the contest! Don't try to cheat me! "Fine, fine! You won, as long as you promise to be quiet. Now it feels like the thunderbug lays eggs in my head." It's good that we understand each other. [Persuade][Lie] What? I clearly remember you making a fool of yourself. "Yes, well I was hoping you'd forgotten that raunchy song about the queen. But what else could I rhyme with "Vulkhel Guard?" I'll take your word for it. I don't really remember. "Are you ready? And can you stop thinking so loudly?" I'm ready to leave for Haven. "Yes, yes. We'll cast off as soon as the Prowler stops spinning ...."
I have to take care of some things before we leave. "The Prowler is ready to sail when you are." "Haven is under pirate attack! Worse, they climbed in through our portholes and breached the hull. I'll use their blood to swab the decks. Think they'll put more holes in my hull, do they? We had just finished repairs on the last ones!" "We can't shore up the keel with saboteurs around. But we spotted a soldier nearby ... looks like Khajiit royal guard and some refugees. We'll keep the pirates off our own backs. Head to that soldier and see if you can help the refugees!" I'll talk to the soldier. Leave the ship to talk to Lieutenant Kazargi. There is no way to return to the deck of the Prowler once you left. After completing the quest, she is found in Haven's harbor on Jeer-Tei's ship, The First Witness. "This ship ... she's impressive. Maybe someone will give her to me. "Commodore Jimila." Ha! What do you think of that?" After finishing the quest, she will stand in the middle of the Prowler and you can talk to her again. "It'll be good to have the wind in my fur and sea air in my nose again. I can't wait to set sail and put Anvil behind me." Optional dialogue if you completed the Aldmeri Dominion quests. How's the life of a privateer in Queen Ayrenn's navy? "Profitable and dangerous. I'm happy to continue ferrying troops for the easy gold, but when the Queen commands us to show our claws, we oblige. Many a captain has made the mistake of dismissing the Prowler as a threat, to my benefit." Have you encountered any Sea Elves since we took down Peledil together? "Ah, the tale of the Prowler and the fierece Maormer sea serpent. It grows with each telling! You might be amused to hear what the crew claims happened that day. It's quite a popular story in the port towns." "We were set upon by one hundred Sea Elves, surrounded with no hope of escape. But you defeated them soundly with one bare fist while swinging from the rigging. Then you hopped onto the sea serpent and rode it into the side of the Maormer ship!" "You think? That's the tamest part! By all accounts, your battle with Peledil rocked the seas and reshaped the coast. They say you turned the sea serpent into a mount! Ah, I'm glad you're still well, my friend." "I'm surprised to see you in this part of the world, old friend. Not that I'm complaining. It's always good to see you. But what are you doing in this land of mud and bugs?" I'm here on behalf of Nesh-Deeka to offer you a deal. "Intriguing. Deals keep bringing me back to this swamp, after all. So many captains consider Lilmoth to be beneath their notice, but their loss is my gain. Very well, speak. What's your proposition?" First, Nesh-Deeka wants you to have this vossa-satl as a gift and to display the depth of his skill. Tell me more, envoy. What is this contraption and why should I care?" The vossa-satl is a musical instrument. 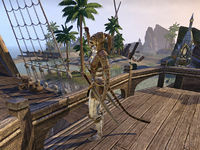 Argonians in other lands would love a little sound of home. "Hmm. The sound of home. Yes, I can see the profit in that. I'd target tavern owners with Argonian clientele. But what sort of instrument is this? I've never seen anything like it." It's a sort of wind and keyboard instrument. It uses frogs to make its sounds. "I think what you just said will make more sense after another couple of drinks. Still, it's exotic, I'll give it that. And I love a good challenge. Very well. Tell Nesh-Deeka we have a deal. Let's start with five of these and see how they sell." I'll let Nesh-Deeka know he has a deal. "It sounds like … well, a bunch of croaking frogs to me. But I suppose Argonians might find the noise to be soothing. We'll see how it sells and then decide whether or not to expand our arrangement." Captain Jimila only appears in Lilmoth once The Sounds of Home reaches the right quest stage. This page was last modified on 11 March 2019, at 02:24.